We carry a full line of Miniature Helmets. These mini helms are miniature replicas of our full size historic helmets. The miniature helmets make perfect gifts for history buffs and collectors. They look great at home or office, especially if you don’t have room for a larger Medieval or Roman helmet. We’ve tried to include a wide variety of historical helmets from Roman, Viking, Dark ages, Medieval and the Renaissance. Some of our early replica mini helmets include Roman Centurion Helmets, Mini Roman Plumes (to fit our mini Roman Helmets), Mini Viking Helms, the famous Sutton Hoo Helm. The mini medieval helmets we carry are the barbuta helmet, pig face basinet and sugar loaf helmet. The Renaissance Mini helmets are the comb morion, Cabasset helmet and the Maximilian helmet. Our Collectors' Edition European Mini-Helm features a stand for display and is great for collectors. Height is 5.5". This Mini Comb Morion Helmet is a miniature version of our full size Comb Morion Helm. This helm was a development of the medieval kettle hat. Consisting of a tall skull with a broad brim that sweeps upward to a peak at front and rear. This Burgonet helmet is a miniature version of a 16th century light Burgonet helmet, characterized by its high skull, brow peak, and hinged ear pieces. This type of helm allows excellent vision and was usually worn with a buff. This Mini Sutton Hoo Helm is a miniature version of the famous Spangenhelm design with face guard, brass fittings hinged cheek pieces and neck guard. 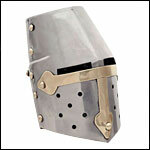 This Mini European Close Helm is modeled after the full size, 15th-16th century European Close Helm. This is the classic "Knight's" helm. The full visor and bevor pivot from bolts on each side of the skull. This Red Roman Plume, or crest, is a miniature version of the horsehair crests for our Roman helmets. 6" long, 3" tall. Our Miniature Pig Face Helmet is a fully functional mini version of the classic North Italian (Milanese) Houndskull or Pigface Basinet! Late 14th Century medieval helm c 1390. Fully functional visor is trimmed in brass. Hand Made. This Miniature Dark Age Helmet is a mini version of a spangenhelm design. Steel with brass accents. The perfect size for display, or making your dolls into warriors. Measures 7 inches tall and comes with a metal stand. Our Miniature Helmet Stand. Hand Made from Steel Wire is sized just right for displaying our mini historic helmets. Our Mini Cabasset Helm is a miniature of the full size 16th century Cabasset Helm. This helm is a development of the kettle hat was widely used by the infantry consisting of an almond shaped skull ending with a stalk like projection. Our Miniature Viking Winged Helmet is a fantasy winged helmet and a miniature version of a full sized Viking Winged Helmet. This helmet is of Spangenhelm design with brass fantasy wings, eye guards, cheek pieces, and neck guard.